Are you someone who is looking forward to set your foot in the digital marketing industry? If answered yes, then there can be no better time than the present. As per federal reports, the digital economy is soaring 10times faster as compared to the conventional economy and this will lead to a skills gap of 900,000 vacancies by the end of 2017. So, it can e said that digital marketing is indeed moving at a frightening speed and most often the sole way in which you can keep up with the soaring trend is by reading. With the large numbers of digital marketing blogs in the market, it can be tough to differentiate between the ones which are useful and which are not. 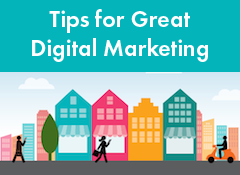 The Digital Marketing Institute keeps up with the best quality blogs, those that are reliable, valuable, original and interesting at the same time. If you’re someone who wishes to jumpstart your career in the digital marketing industry, here are few tips for you. As mentioned above, the digital marketing industry is not only growing fast but it is also excessively competitive. It has become extremely easy for the business organizations to set the difference between the people who are willing to learn and those who are already aboard. The burning desire to succeed and the passion are necessary for anyone to succeed in the world of digital marketing. So, make sure you have it in you. You should stay on top of the biggest online marketing blogs and be updated on the industry news by following the internet and the social media. The big shots like Facebook, Twitter and Google keep tweaking their algorithms and paid advertisement platforms and hence stay ready to face a wild ride while keeping yourself updated on those changes. Keep reading few of the SEO, PPC, content and social media blogs. Ensure surrounding yourself with those people who are more talented than your own self. These people will form you support system whenever you face any kind of problems and they can also help you open doors to opportunities which you may not have found otherwise. Attending conferences and industry meetings will help you in nurturing such business relationships and you can also improve your skill set through presentations and workshops. Follow the top marketing blogs so as to get acquainted with the most commonly used digital marketing terminology. You should become comfortable with acronyms like SEM, PPC and SEO so that you can have a clear idea on what they are and how they work. All of them have different meanings and misunderstanding them can have a bad impact on the skill set of the beginner. You should also gather the ability of analysing digital marketing campaigns and know the elements which worked and which didn’t. Can you imagine yourself to be an online marketing hotshot without any online presence? If you’re eager to show your employer that you have the capability of building the visibility of the company, you have to first build your own brand. Having a strong online presence is the first thing which should decide your brand image. Therefore, now that you know the different ways in which you can start off your career as a digital marketer, you should take into account the above mentioned tips and advices from the experts.